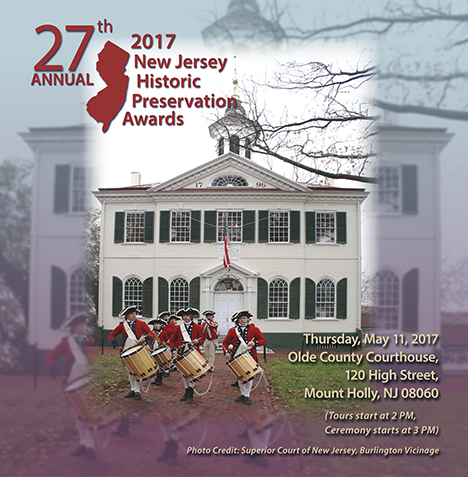 Six recipients of the annual New Jersey Historic Preservation Awards were honored at a ceremony on May 11, 2017 held at the Burlington County Olde Courthouse in Mount Holly, New Jersey. Celebrating May as National Historic Preservation Month in New Jersey, the Department of Environmental Protection’s Historic Preservation Office and the New Jersey Historic Sites Council presented the competitive awards honoring projects, groups and individuals dedicated to preserving the State’s architectural, archaeological,and cultural history. This year, New Jersey commemorates the 27th anniversary of these prestigious awards. The award-winning 2017 candidates illustrate valuable historic preservation work on state and local levels. They incorporate significant community reinvestment in New Jersey’s towns, and demonstrate high standards in how significantly historic properties impact our modern world. 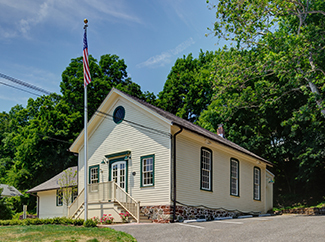 The Millington Schoolhouse/Old Town Hall is a treasured local landmark which has served its community since its initial construction as a school. The school operated for almost one-hundred years, and as a library for thirty-eight years. In 1928, it became the town hall until 2002, after which it remained vacant. The significance of the building lies in the fact that it is emblematic of the growth and evolution of Long Hill Township. It is a public resource that changed and expanded with numerous additions as it met the needs of the growing community. Due to its rich history of community service, the building has been rehabilitated to honor its past, yet return its function to a well-used community asset. In 2009, the township retained Clarke Caton Hintz to develop a Preservation Plan for the building, which utilized the Secretary of the Interior’s Standards for Rehabilitation to guide the work process. It also broadened the understanding and appreciation of the property, and developed the future interpretive approach for the building. Since 2010, Clarke Caton Hintz has developed construction documents and managed three phases of rehabilitation work, with the project’s primary challenges being the deferred maintenance and obstruction of original finishes, as well as lack of modern systems, and utilities that would make the building functional and flexible for public programmatic use. Additional work included structural repairs and exterior envelope improvements, site and life safety improvements, interior repairs and renovations, and mechanical and electrical upgrades in the primary historical spaces, as well as in the tenant office spaces. The contemporary finishes are historically sensitive, and the finishes of the original school room were retained, providing a historical backdrop for future community uses. 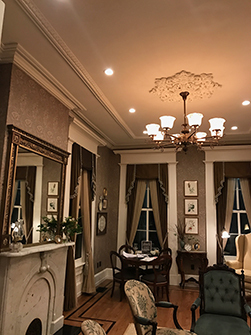 The BAYADA Headquarters Interior Rehabilitation Project focused on a house built in 1858 by John Buzby, and which is an excellent example of a Greek Revival Italianate building, located in the heart of the Moorestown Historic District. Based on historic documentation, there have been very few alterations to the building footprint. In 2015, BAYADA Home Health Care founder, Mark Baiada, purchased the property with the intention of restoring it for use as the corporate headquarters of his company. The focus of this project was the interior rehabilitation, since the exterior was in good condition, although aluminum siding had previously been added. The project acknowledged the need to alter and add to the historic property to meet the improvements needed for public use as an office, and to meet building code requirements, while retaining the property’s historic character. Since the owner wanted to meticulously restore and preserve the interior architectural features, great detail and care was taken to use classical Victorian finishes, such as William Morris wallpapers and traditional Victorian tile imported from England to complete the restoration. The project demonstrates both excellence in preservation, as well as excellence in supporting urban revitalization and the local community. It is rare to find a commercial company with a passion for preserving a historic building, but Mr. Baiada had the vision, foresight, and passion for preservation to select a historic building within the heart of a historic community and to repurpose and revitalize it for the benefit of both the company and the community. They have set the highest standards for raising awareness in preservation for commercial use, and demonstrates that a historic building can work equally well for modern office needs. The reconstruction of the Nevius Dutch barn at Rockingham is a complete and accurate reconstruction of this threatened building type. As with many remaining Dutch barns in New Jersey, this one was on private property and was jeopardized by neglect and demolition. The reconstruction of the barn included re-erecting the repaired frame on a new concrete slab with a stone veneer, enclosing it with new clapboard siding, a cedar shake roof, a new wood floor, and lighting, fire detection, and infrared heaters. While in its original location, the Rockingham Dutch barn had been anglicized, but during dismantling, the original H-bents were salvaged along with any side aisle timbers and rafter plates that could be re-used. Additionally, timbers were retained if they contained information, such as mortises, that could provide evidence of the original configuration and evolution of the barn. These were critical in understanding the wall framing at the aisles, as well as the height of the side walls which defines the overall geometry of the barn. The original H-bents were entirely preserved and re-used. Many of the secondary timbers and side aisle walls were beyond salvaging, so were reproduced from rough-sawn white oak. The original rafters, lost during the roof change, were reproduced from douglas fir. The goal is to preserve the Rockingham Museum and further the understanding and interpretation of the entire property as an eighteenth-century farmstead as it might have appeared when Washington lived on the property in 1783. 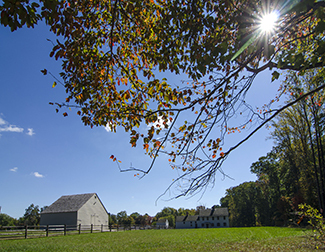 Following the relocation of the house and reconstruction of select outbuildings, the barn was the next building to be constructed to advance this effort and more completely interpret the site, while providing critical three-season space for larger group events. On February 3, 2017, the New Jersey Historic Trust launched the first website dedicated to promoting heritage tourism in the state of New Jersey. Its purpose is to support and improve quality visitor experiences at the state’s many and diverse historic sites. The economic impact of heritage tourism in New Jersey was documented in a 2013 Historic Trust study which indicated that heritage tourism generated approximately 11 million visits in 2012 and resulted in $2.8 billion in visitor spending. The development of the website arose from the needs identified in a master plan entitled “Linking our Legacy to a New Vision; A Heritage Tourism Plan for New Jersey.” Published by the Trust in 2010, it documented the untapped potential for a robust heritage tourism sector, and the “Journey Through Jersey” website is the initial step towards broadly marketing heritage tourism, supporting and improving visitor experience, and encouraging preservation of New Jersey’s historic sites. The innovative website design encourages interactivity and offers a variety of ways to plan a visit. Website visitors can choose from three options: by theme, by region, or by interest. The interactive map locates the historic sites, identifies them by theme, region, or interest, and provides a description of each site. Each site also has its own page, complete with description, photographs, map locator, hours and amenities. 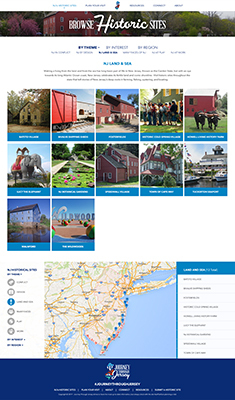 The website offers heritage tourists the tools to plan a visit that meets their expectations and interests in New Jersey history and preservation. This comprehensive and innovative website is a crucial step towards growing a recognized segment of the tourism market that benefits the economy, enhances the state’s reputation, and raises awareness of preserving and interpreting our past. The restoration of Metuchen’s cast iron water fountain, known locally as the “horse trough,” was an important local historic preservation project that high-lighted the creative collaboration of community organizations, the quality of the restoration by a well-respected firm, and the significance of the monument at a prominent location in town. For 117 years, the beloved local landmark has stood within a landscaped triangle, and was originally built as a water fountain to service both people and animals. The fountain’s large front basin served to provide water to horses, a lower bowl (now gone) was to serve dogs, and its rear spigot allowed humans to enjoy a cold drink. Later, Stanley Steamers – turn of the last century cars that ran on boilers – used the trough to refill their boiler water. The increasing deterioration prompted the Woodwild Park Association to spearhead the restoration effort. In June of 2016, they were joined by the Metuchen Arts Council, the Metuchen Garden Club, the Metuchen Borough Improvement League, Metuchen Historic Preservation Committee, and St. Luke’s Episcopal Church. The collaborative effort resulted in an innovative approach to raising the needed funds, leading to a major financial commitment from a local bank. The restoration job was awarded to a well-qualified company, and the town will celebrate its return with a re-dedication ceremony. 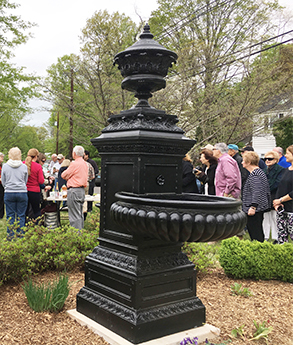 The restoration of Metuchen’s horse trough, including the creative and collaborative fundraising, the high-quality restoration, and the opportunity for a community celebration, have all helped to raise community awareness of the importance of historic preservation. At a time when Metuchen is striving to strengthen its commitment to historic preservation, this effort has been successful in education the public about the importance of preserving Metuchen’s history. 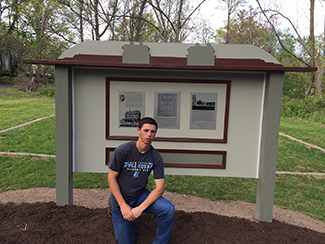 The Sarah B. Jordan Commemoration project was orchestrated by Boy Scout Steven Zederbaum in his endeavors to earn his Eagle Scout rank, which is the culmination of a Scout’s training and demonstrates leadership of others while performing a project for the benefit of the community. Inspired by a local historian, Steven decided to commemorate the boarding house of Sarah Jordan, a relative of Thomas Edison, who, at his request, established a boarding house in 1878 across from Edison’s lab in Menlo Park to house his lab workers. The proximity of the boarding house to the lab facility allowed the inhabitants easy access to work, especially when their services were required well into the night. The boarding house also served as a community lunch room and center for social activity. While Sarah Jordan’s boarding house still exists, it was moved to Greenfield Village Museum in Dearborn, Michigan in the 1920’s, as part of the Henry Ford Museum. It was here that Steven started his exhaustive search for the plans needed to recreate the footprint of the boarding house. His research produced the historically correct information that recognizes the contribution of Sarah Jordan to the history of Thomas Edison’s accomplishments. The Eagle Project required a significant effort on the part of the candidate seeking the Eagle Rank. It required numerous research hours, scouts and community volunteers planning and work time, and fundraising efforts which provided the needed resources through corporate and local business donations. The project successfully interpreted the history of Sarah Jordan and the Jordan Boarding House, bringing the history of a seemingly empty lot into focus for present and future generations of New Jerseyans.